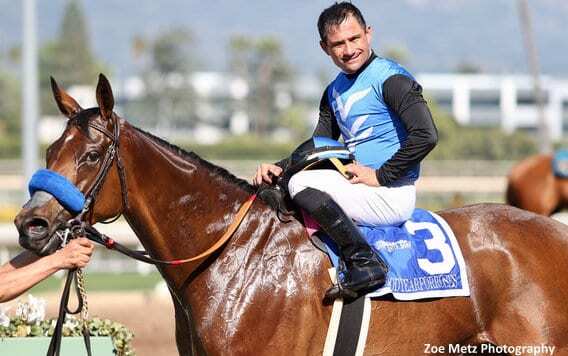 A scary incident in the tenth and final race of the evening at Del Mar on Saturday ended with jockeys Corey Nakatani and Geovanni Franco being transported to Scripps La Jolla Hospital. According to drf.com, both riders were moving their arms and legs, but were placed on backboards as a precaution. On Sunday morning, drf.com reported that Franco had been released from the hospital with minor pain in his ankle, and was out at Del Mar working horses before the day's races. Nakatani, meanwhile, remained hospitalized overnight, awaiting further evaluation of both his neck and his left leg. The horse Irish Spring, under Nakatani, clipped heels with Aussie Fox, which appeared to drift into his path. Irish Spring fell and sustained fatal injuries, while Franco's mount Bitter Ring Home was unable to avoid the fallen horse. Bitter Ring Home was corralled by outriders and returned to the barns. Aussie Fox, ridden by apprentice Assael Espinoza, was disqualified for the interference and placed last. This entry was posted in People and tagged assael espinoza, Corey Nakatani, Del Mar, del mar thoroughbred club, geovanni franco, irish spring, scripps la jolla hospital by Paulick Report Staff. Bookmark the permalink.